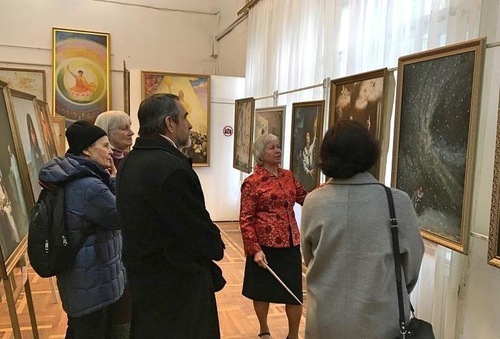 The Art of Zhen Shan Ren (Truthfulness, Compassion, Forbearance) International Exhibition was held in the government office district of Kiev, the capital of Ukraine, for 14 days from late March to early April 2019. The exhibition attracted people from all walks of life, including politicians, artists, and media reporters. Patrons to the exhibition were amazed at the warm and peaceful energy the artworks emanated. Some of them said that they would like to learn Falun Dafa, while others condemned the Chinese Chinese Party’s (CCP) persecution of the practice. Nikolai, a Ukrainian artist, expressed his appreciation to the exhibition organisers for presenting the show. He said that the spiritual peace and beauty conveyed in the artworks impressed him and that the exhibition as a whole inspired a fresh look at the relationship between life and the universe. He noted the focus on “good versus evil” and “light versus dark.” It gave him a feeling of breaking away from isolation and moving to an eternal space. “The eternal space has multiple layers,” he said. “It’s the universe. The fire in the universe brings warmth. This exhibition helps us visualise this. Another artist, also called Nikolai, said that the persecution scenes in the artworks reminded him of the repressive Ukrainian Communist Party “movements” from the 1930s to the 1950s. Alexei, yet another artist, wrote in the guest book that he appreciated being able to see the depictions of the horrendous crimes committed by the CCP and the evilness of communism. He thought the artworks spoke to people’s conscience and pointed out a path of perfection and sacred love and had made his day. A patron leaves her comment on the signature book. 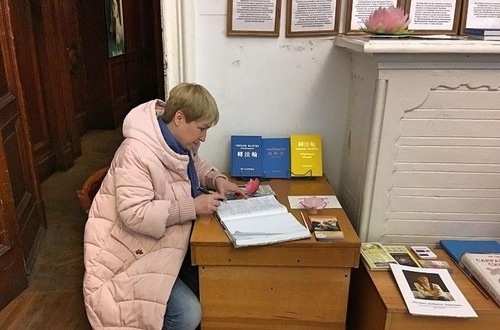 Grabovskaya, a professor at the National University of Kiev, wrote that she had learned a lot about Falun Dafa from the artworks and that they had prompted her to reflect on the meaning of Truthfulness-Compassion-Forbearance. Ileana, a local resident, thanked the organisers for exhibiting such inspiring artworks, particularly in regard to remaining firm in one’s belief and fostering harmony in the world.